When Honor Flight Fayette Board member Fred Smith went with friends to the Talladega race track to test his driving skills, he received a pleasant but unexpected surprise. 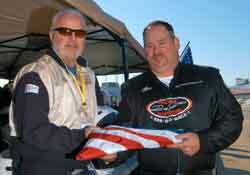 Since he was the only veteran in the group, he was presented with the United States flag that was flown on the pace car that day. As a retired pilot in the Air Force who is now working with World War II veterans, this gesture was especially meaningful and significant to him. Honor Flight Fayette will make its 7th and last flight in September, making a total of almost 500 veterans that have gone on the one day trip to D.C. to see their memorial.